Where does my food come from? How many Americans actually ask this question? It’s something that I didn’t really wonder or ask until a few years ago, when I saw an episode of Dirty Jobs that took place on a pig farm. Pigs are one of my favorite animals, and while I’m still fine with eating them, I was horrified by how they were treated. This realization caused me to start looking more deeply at where all of our food comes from, and really changed the way our family eats. It caused us to join our first CSA, to buy a whole cow from a local rancher, and even to start growing things ourselves. But most importantly, it helped us realize the necessity of asking questions and talking to people about food issues. We started watching movies like Food Inc, King Corn and Fresh. We began visiting local farms and food producers, asking them about their experiences and what all the policies and things we hear about in the news really mean to them. We began moving away from supporting big industry agriculture and started to promote buying local whenever we had the chance. For the past few years, the food movement has been growing and people all over the country have been asking questions about things they’d never really thought of before. The movement has mostly been focused on the idea of moving back toward “slow food” and supporting farmers and ranchers that use natural practices. But now there’s a group called the US Farmers and Ranchers Alliance, or USFRA, an umbrella organization of state farm bureaus and grower’s councils, which is funded by some heavy hitters in the food industry including Monsanto, Dupont, and the National Cattleman’s Beef Association. The USFRA’s mission is “to lead the dialogue and answer Americans’ questions about how we raise our food”. Now I’ll be completely honest, I was very torn when I was asked to write a post for USFRA. While they may not see themselves as a policy organization, they are definitely being funded by organizations that are, and I strongly disagree with many of the policy goals of these affiliate organizations. I have sponsored posts on my blog, but only when I am able to free share my opinion in that post, and I wasn’t going to pretend I was aligned with USFRA. When I voiced my concern, I was reassured that they weren’t asking me to agree with their position or the answers that they give, but simply to raise awareness of the dialogue they’re trying to create. Now that I can do. While I may not agree with a lot of things about the USFRA, I’m intrigued that this is movement in a new direction for the side of agriculture and ranching that used to try and keep their doors shut and refused to respond to those asking questions. I’m also a firm believer in investigating both sides of an argument. I feel that it takes little intelligence to spout an “opinion” simply parroting back what you’ve heard from one side, and think it’s important to learn as much as you can and form your own viewpoint. This is where my interest in USFRA comes in. I am looking forward to being able to ask some of the questions I have and to investigate their rationale behind some of the practices I disagree with. -With diabetes rates being as high as 1 in 3 children in many parts of the world, how is that related to the way our food is produced and how can it be changed? -The Eat Local movement supports smaller farms, organic farmers and reduces “food miles”. How does USFRA help in those areas? -What kind of policies can be put into effect that will link nutrition programs to sustainable agriculture? Join me in a dialogue about growing and raising food in the US. Do you know where your food comes from? Do you care? What are your thoughts on how food is grown? Let me know in the comments below and you will be entered to win a prize pack containing a Crock-Pot Programmable 6-Quart Slow Cooker and two reusable designer shopping bags from Envirosax. a) Leave a comment on this post in response to the prompt above. I was given a stipend to introduce readers to the USFRA Food Dialogues website and Facebook page. All opinions are obviously my own. I live in a rural area of North Carolina, and buy most everything locally, and the few items that aren’t local come from trader joe’s or whole foods. I like knowing how my food is grown or raised, in the case of meat, and I like the fact that I am helping to support my fellow neighbor farmers. Aloha! We are very fortunate to live in Hawaii. 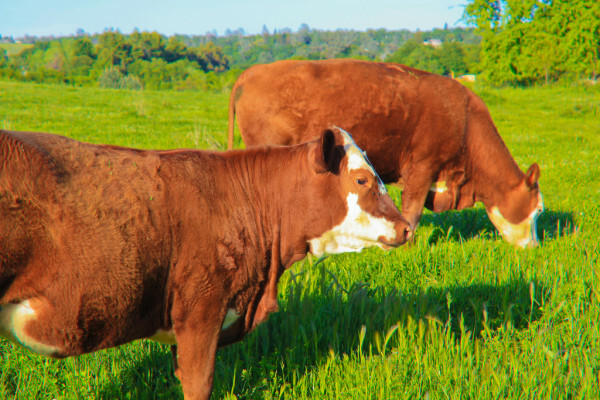 Our cattle is grass fed and the meat is delicious….unfortunately it is very expensive to buy, sometimes beef is $20 per pound or more! Of course most of the foods we eat are shipped in from the mainland. Hawaii has the potential to grow a lot of our own food but once again it is cheaper to ship the food in then grow it commercially. Even at the “farmers” market some stands sell produce grown in other places. As a “local” you know what is grown in Hawaii and what comes from other places. Its very sad when farms close because agriculture in Hawaii is not very profitable. Just started subscribing to your newsletter! Mine is an informational response, not to enter the giveaway. We buy eggs from a local farm that sells to our local grocery stores. We go to Whole Foods (an all-day affair in a city about 1 hour away, as we do other shopping in that large city when we go) usually 2x/year. I’d love to grow more, but we’ve found we don’t have green thumbs, nor the patience/knowledge to learn or do more. We do however make our own sandwich bread, tortillas, yogurt, red sauce, veggie/chicken broth (both), cereal, bbq sauce and probably a couple other things I’m missing. It makes me very happy providing this level of nutrition (and knowing where our food comes from!) for my family. Signed up, hope I win! I’m not a huge meat eater, but my family is. I’ve never thought about where it comes from, thanks for sparking my interest. I am getting pickier about knowing where our food comes from. I prefer to purchase from local growers. Please, do not enter me in the drawing, just wanted to say hi. Thanks Kara! Having fun checking out your neighbor’s blog. We have a small family operation where we have a pretty extensive garden every year and raise 4 black angus heifers, which we sell and keep a half of one for ourselves. It always amazes me how much we can produce from our garden. I’m feeding friends and family members most of the summer. We have 16 chickens and so we have plenty of eggs too. I trade fruit to friends that can so if we don’t freeze it they split the produce they have canned, so everyone benefits. I’ve pretty much gotten away from buying anything at the stores and I don’t miss it. There is nothing so sweet as picking a peach off a tree that is cold from the night air. Buy local or find someone with a garden, they would appreciate the help, I know I do! That’s fantastic Denise! I love the idea of sharing with friends in return for some canned goods. I may do that with our plums next year!